For more than a decade, Readings for Diversity and Social Justice has been the trusted, leading anthology to cover the full range of social oppressions from a social justice standpoint. With full sections dedicated to racism, sexism, classism, heterosexism, and ableism, as well as transgender oppression, religious oppression, and adult and ageism, this bestselling text goes far beyond the range of traditional readers. New essay selections in each section of this third edition have been carefully chosen to keep topic coverage timely and readings accessible and engaging for students. The interactions among these topics are highlighted throughout to stress the interconnections among oppressions in everyday life. Over 20 new selections considering current topics and events such as immigration trends, racial profiling, student debt, Occupy Wall Street and global GLBT rights. An updated companion website with additional resources, including video clips that further complement the readings in each section. Strong and accessible section introductions to highlight key points and relate the essential concepts of any given topic to other forms of oppression. An explicit emphasis on the interconnectedness of social identity and social inequality throughout, with a secondtable of contents that notes the intersections among readings. 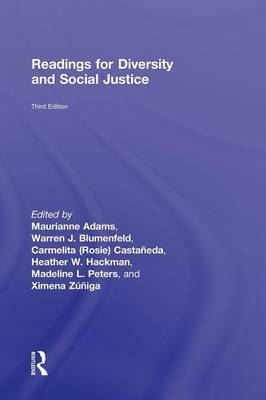 Offering over one-hundred and thirty selections from some of the foremost scholars in a wide range of fields, Readings for Diversity and Social Justice is the indispensible volume for every student, teacher, and social justice advocate.